You are browsing the archive for Reviews. “Mr. President, it’s an honor to meet you,” said the young elven girl dressed in a flowing gown and crowned with a jewel headband. This was one of the best halloween parties ever. 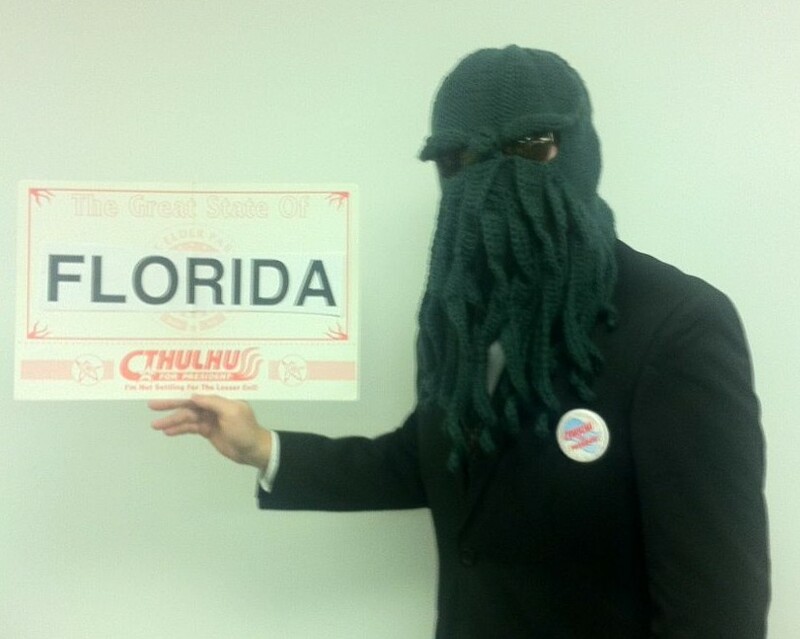 Last Halloween we were looking to get into the festive spirit and we were inspired to do a Cthulhu for President costume to coincide with the Elections of 2013. As part of our C.T.H.U.L.H.U. Campaign of 2012 we searched the endless corridors of the internet in search of the perfect mask. We found a variety of masks but once we landed on Nancy Nutt’s Cthulhu Ski-Mask on Ravelry.com we knew we found The One. Nancy Nutt’s brilliant work is measured to your exact head measurements and acts not only as a wonderful ski mask – but it’s also a great accessory to your Halloween costume collection. Nancy Nutt’s Cthulhu Ski Mask is decorated with pronounced eyebrows to give it that “evil look” and has a number of tentacles that cover the mouthpiece. So at any point in time you’re on the slopes or at a party and want to want to take a swig of your favorite beverage, there’s no need to even remove the mask. Just part the tentacles like Moses did with the Red Sea and party on, Wayne. (“Party on, Garth”). We opted to wear full sunglasses under the mask just to have something other than the eyes popping out. 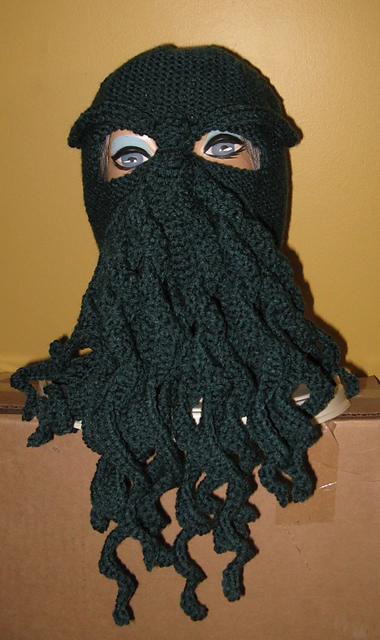 Nancy Nutt’s Cthulhu Ski-Mask is a definate buy for any Cthulhu mythos fan. One could even consider using it on camping trips for story-telling side or in your next campaign when your investigators have taken the turn for the worse. Back to the beginning of the story, so the costume consisted of a business suit, wearing the Cthluhu Ski-Mask and carrying a sign that read “Why settle for the lesser evil. Cthulhu for President” which comes with Chaosium’s Cthulhu For President Kit (link). Miskatonic University is a proud sponsor of a number of projects including Ravelry designer Nancy Nutt, Nando Costa’s The New America and the Miskatonic School For Girls.